CHARLOTTESVILLE, Va. (AP) — Virginia coach Bronco Mendenhall knows there is a risk in depending on major contributions from a few players to determine his team’s success, especially when an injury could damage the team’s psyche. The third-year coach isn’t deterred. Mendenhall is making no secret what he needs from transfer quarterback Bryce Perkins and wide receiver-running back Olamide Zaccheaus, perhaps the two fastest offensive players on the Cavaliers‘ roster. Add running back Jordan Ellis and speedy wide receiver Joe Reed to the mix and Virginia expects to have several weapons in a new offense that the dual-threat Perkins should open up with his running ability. But the Cavaliers have no experienced backups to Perkins, so keeping him healthy is critical. Mendenhall hasn’t been bashful about telling Zaccheaus that he expects more from him this year, even though the junior set the school single-season reception record with 85 catches for 895 yards and five touchdowns in 2017. Zaccheaus and Ellis, a bruising runner, will have plenty of opportunities. “The more the better just because (Ellis is) so physical and so consistent and so productive, so the more the better for both him and Olamide. 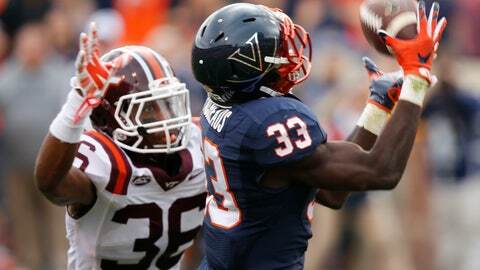 As many touches as they can get,” Mendenhall said. Ellis ran for 836 yards last season, averaging 3.9 yard a pop and scoring six touchdowns. He added 22 receptions for 137 yards and another score, but spent the offseason stewing over Virginia’s bowl game ineptitude. The Cavaliers reached the postseason for the first time since 2011, but after Reed returned the opening kickoff for a touchdown, they gained just 175 yards and were blown out, 49-7, by Navy in the Military Bowl. “It definitely put motivation in us to the spring and we’re definitely motivated every day to come out here on the practice field and kind of revamp and show who we are,” the 5-foot-11, 225-pound senior said. His longest run last year went for 25 yards, but he expects his speedy teammates to help him do more. Zaccheaus views Perkins’ presence the same way. And that, Mendenhall said, will be exactly what the Cavaliers need.